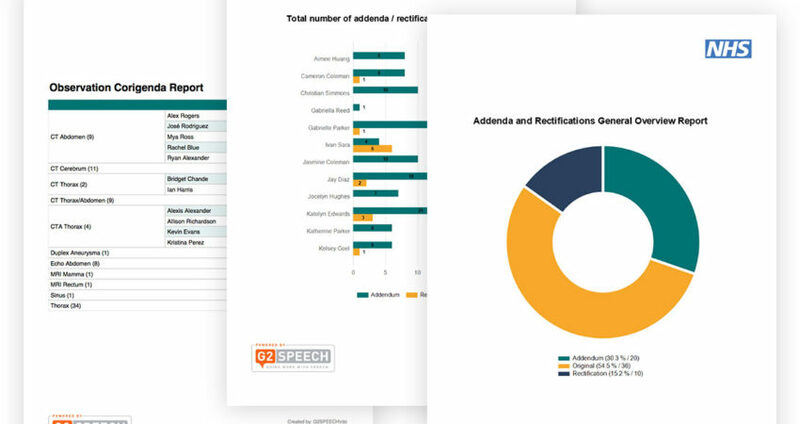 Oxleas NHS Foundation Trust has been using the speech-enabled, document creation solution, SpeechReport provided by G2 Speech since February 2014. Since the implementation the Trust has realised some of the real potential that speech recognition technologies have to offer. Nicola Rodwell, Project Support and Training Officer is part of the Clinical Transformation Team at the Trust is charged with analysing and reporting on clinical correspondence data within SpeechReport using G2 Analytics. G2 Analytics is the reporting tool, provided by G2 Speech, for monitoring speech recognition and performance use. The platform enables customers to collect, analyse and report on operational as well as clinical data. The platform delivers fast and effective data collation. Nicola had previously been creating reports for teams on items such as number of documents created, turnaround times, speech recognition rates and more. Previously Nicola had created these reports manually and this took almost a week at a time to produce. With the use of G2 Analytics, this process is automated with simple, professional reports and graphs are created within a few clicks. The reports now take Nicola less than a day to create and circulate. Each team receives a report which provides information for performance management. “I love G2 Analytics! We’ve been using it as the sole means of data analysis for about six months now. G2 Analytics makes it very easy to create bespoke and ad-hoc reports as well as the standard reports provided.